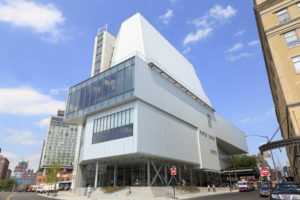 The Whitney Museum of American Art, located in NY, NY. From October 28, 2016 – February 5, 2017, the Whitney Museum of American Art will be hosting Dreamlands: Immersive Cinema and Art, 1905–2016. The exhibit will explore the evolution of film throughout history, primarily as it relates to changes in technology and technique. The exhibit is quite large, taking over the Museum’s fifth floor gallery with additional film screenings being shown on the third floor. Chrissie Iles, who is curating the exhibit, has devoted many years to the study and analysis of film. Iles, who is the current Anne and Joel Ehrenkranz curator at the Whitney, spent four years alone preparing for Dreamlands. Iles consulted with film experts from around the world in addition to conducting her own, in-depth, scholarly research. The earliest works show how primitive filmmakers, even back in the early 1900s, were experimenting with various different kinds of themes, camera shots, colors, and scores. The exhibit uses Oskar Fischinger’s 1926 work Raumlichtkunst (Space Light Art) as an example. This portion of the exhibit features concept artwork from Disney’s Fantasia (1940). Fantasia stands as one of the most influential films of all time due to its animated images and classical score. Dubbed the “digital age,” the 1990s marked a shift towards computer-generated imagery. This advanced technology created a sort of “virtual reality” that allowed filmmakers to create more convincing, sci-fi scenarios. By far the most interactive portion of the exhibit, this portion of the gallery features flicking lights triggered by human movement. Visitors can also look up at the ceiling and see thousands of frogs, which were special effects props used in the 1999 film Magnolia.